VERO BEACH – Indian River County Sheriff’s Deputy Ben Buffington heard an audible alarm coming from the BP Gas station located at 1999 9th Street SW in Vero Beach. 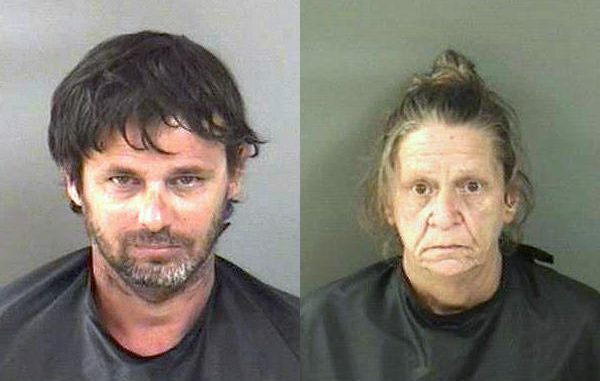 As the deputy approached the business, he heard Jimmy Strickland,47, and Grace Daley, 56, both of Vero Beach, flee into the woods. A perimeter was established and both were apprehended. “Strickland resisted arrested and was apprehended by Deputy Richard Henson and his K-9 partner Falko. Both were charged with felony attempted burglary and felony criminal mischief. Strickland was also charged with resisting. Both are being held at the Indian River County Jail with no bond,” Major Eric Flowers said. Another incident involved a shooting at 1366 25th Avenue SW after a 21-year-old man was injured by gunfire when two as yet unidentified black males entered his residence in an attempted home invasion robbery. Narcotics and drug paraphernalia were located inside of the home and detectives believe the attempted robbery to be drug related. The injured man was taken to Lawnwood for non-life threatening injuries. Investigation continues today into this Vero Beach incident. “During this state of emergency, we will not tolerate criminal behavior. Our deputies have been working hard throughout the storm to keep everyone in our county safe and we will not let those with criminal intentions take advantage of the good, hard working people of Indian River County,” Indian River County Sheriff Deryl Loar stated.